We have come a long way from inventing stone tools to axes to electric hacksaws, but there are still people who believe that technological developments lead to loss of jobs, and are somehow bad for society. Stone age tools: a high-tech engineer in 3000 B.C. When we make a tool to simplify our job, whether it is a sharp stone to cut wood faster or an ax to remove trees faster, as our ancestors did, or an electric hacksaw which we use today to make chopping of trees even faster than an ax, we make our jobs simpler. The same holds for all inventions-software, robotics, computers, etc. We invent tools to make our jobs simpler, to produce more for the same hours worked. Jobs losses from invention of tools, machines, robots, AI, etc. What happens to all the jobs which are eliminated by computerizing the paper ledgers, by employing all these machines in the fabrication of things, like the horse buggy makers who lost jobs to automobile makers or the drinks vending machines which robbed the jobs of people who sold the drinks manually? They are lost, but those workers find other jobs! Our predecessors were doing entirely different jobs than us-there was no NASA or Boeing or Mitsubishi in 1500 AD- clearly jobs shift, and that's the nature of things. But it is nothing to worry about. If a machine or robot takes away a job, the best job for the person who lost their job is making more machines of this kind, or to operate machines made by others (some machines like a mining truck, a bulldozer or an airplane need a lot of training to operate). This is how Japan does it-that country loves automation, machines, and instead of manual labor, the Japanese want to invent machines and robots for everything, which is the right approach to development. Women are even marrying robots now in Japan, and it is a perfectly legal union! The best job for humanity is to make and operate tools and machines (robots included; robots are simply machines which can move and have some degree of intelligence) which do your work faster, and this is exactly what technological development has been for thousands of years. Modern day tools: a factory worker in 2000 A.D. Whenever someone talks about loss of jobs because of new software, robots, tools and machines etc. you should tell them that the best jobs are to develop more software, robots, tools and machines. Repetitive and mundane tasks can be done by machines; and humans can dedicate themselves to producing more and more machines for more and more tasks, which is the hard part. When you see a bullet train or a plane you cannot not be marveled at the genius of humanity. If McDonald's can serve burgers using robots, it would be awesome-the people who work in McDonald's right now can find jobs building or fixing or maintaining these robots, instead of flipping hamburgers all day. Semiconductors, software, robots internet, telephone, etc. 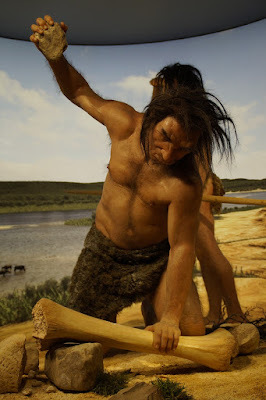 are just an extension (over centuries) of stone age tools, chisels, axes, matchsticks, paper, watches, washing machines, etc...technological advancement is continuous, and we are constantly improving our productive powers by inventing new tools. We produce more for the same work (same man hours worked) with these tools, which is what human progress is all about. Primitive tribes have everyone doing something-mostly foraging for food. The more developed the society, the less the need to work. Progress is not about keeping everyone employed-it is about efficiently producing things. That's where tools, machines, robots, AI (Artificial Intelligence), etc. help-they help produce consumable goods more efficiently. Lamenting about the loss of jobs because of automation, robots, etc. is the same as lamenting about the progress which intelligent humans make in producing goods more efficiently or cheaply. The more developed and rich a country, the more tools and machines it has. This does not lower wages; it actually increases wages. It is the abundance of capital, these tools and machines, which makes people in developed countries produce far more (per hour) than an undeveloped or poor country, where everything is done manually and by hand. If you travel around the world and go from a developed to a poor country-you can see that everyone is working their 8 to 10 hours a day everywhere, but the real production of goods is much higher in a developed country because of tools, machines, etc. Witness giant cranes next to a Japanese highway being constructed; vs people literally with shovels next to a highway in Bolivia. The net work done is 10x or 100x more in Japan than in Bolivia for the same number of total man hours spent. The warnings for loss of jobs because of technological progress are nothing more than luddites' arguments against modernization and technology. Smith in his Wealth of Nations may have underestimated the role of better tools and what we call technology today (he mentioned it as one of the three effects of division of labor, but did not think of it as the most important one. The other two were a) Workers getting more skilled when they do only one thing and b) the losing less time in changing jobs when they do several jobs at the same time). After all, we know that humans have been making tools since the stone age (sharp tools made of stone, hence the name stone age) and division of labor alone without the invention of tools would probably not lead to the massive improvements in production powers of society. Even in his pins example, there are many tools which the workers use to produce so many more nails per day, and it is highly doubtful that they would be able to produce so many pins without all these tools and machines which they had. With good tools, good machines (machines are sophisticated tools) you simplify many tasks; and I am of the opinion that it is the tool makers, the inventors of tools, machines, technologies, etc. who have been driving humanity forward. A bow and an arrow are tools invented by an extremely intelligent ancestor of ours. We are always fascinated by new tools and machines and highly respect the people who make them, and there is no reason for me to believe that this was not the case in 5000 BC. Organizing labor so that each person does one or two things and specializes in them (the skill of a capitalist or a businessperson),which is the foundation of division of labor, is a skill much easier to acquire than inventing new tools and machines. The large number of successful corporations today with tens of thousands of workers who dedicate themselves to making tools and machines (Caterpillar, Hitachi, Boeing, Intel, Daimler Benz, Lenovo, Google (software tools), etc.) 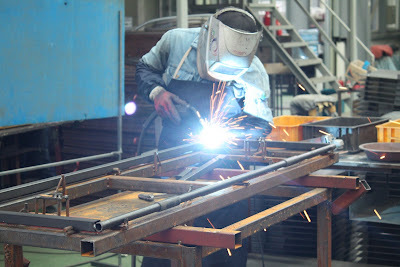 is a good example of the skill of tool making being a very important part of society. What we call high tech today is an extension of the same skills which produced the stone age tools, the bow and arrow, the hoe, etc. etc. And this will go on; the tools we use today will look very primitive in a few hundred years. Even the guns and the powerful cannons of a few hundred years ago look primitive and low-tech in comparison to the sophisticated war machines like tanks, supersonic jets and submarines of today. I do believe that humanity's advancement is continuous, and anything which is older than a few hundred years looks really primitive to us, at all times, not just today, but in the past and future (so if you are alive in 1300AD you look at tools from 1100AD as really primitive; and if you are going to be alive in 3200 AD you will think that tools from 3100 and before were really primitive). I cover this "the present is special fallacy" in another article here. The massive improvement in technology is correlated well with human advancement-and I believe is also the most important cause of human development and progress. Good tools, good machines simplify our lives very much; and while putting them together is the job of capitalists, we all, including the capital owners themselves, value a skilled mechanic or a technology oriented person quite highly. We don't have to go back in time to see how our ancestors used tools and machinery. In many parts of the world there are still aboriginal tribes, and if you look at how they live, you get a glimpse of how our ancestors lived. Aboriginal tribes and poor countries have less automation and tools than rich countries; and this shows you that a society with a large number of machines is a developed, well-to-do society. I will give some concrete examples of excellent machines of the present day and how much they exist in poor and rich countries. Washing machines: Most people living in developed (rich) countries wash their clothes using washing machines. In poor countries, most people still (2018) use their hands to wash their clothes. Good machines with reliable after sales service, abundant water and continuous electricity are not available in poor countries (these are requirements for using a washing machine), and so even the wealthy in poor countries do not have washing machines-they outsource the washing to a maid who comes and washes their clothes for them. The maid who washes the clothes is better off working in a factory which produces washing machines (she will get paid more), than washing all these clothes by hand. Parking meters: In most downtown areas of big cities in rich countries, you park your car and pay the money in the parking meter. In developing or poor countries, there is actually a human being who comes to charge you for your car. The parking meter has eliminated the job of this human being-but it is much nicer and efficient to park cars via a parking meter than involve a human, and this person is better off (paid better) by building and installing more of these parking meters, maintaining them, etc. than doing the charging manually. Self-checkout counters in grocery stores: This is a rather new invention in developed countries-where people self-checkout their grocery store purchases than going through a cashier-using a bar-code scanner and paying via cash or credit card right at the machine. The job of a cashier is very stressful, repetitive and boring; it is much better if the cashiers were replaced with self-checkout counters and all these cashiers will now have better jobs (and better pay) in working to make more of these self-checkout counters, installing and maintaining them, etc. These type of self-checkout counters only exist in rich countries and even there rather occasionally, and it will be a long time before poor countries can afford them (because there are better uses of capital in poor countries-e.g. in making washing machines, parking meters, etc., which will most likely precede the self-checkout counters in each of these countries, i.e. the progression of development will follow the same trend approximately in all poor and developing countries in these three machines-people will most probably will have washing machines and parking meters than self-checkout counters in grocery stores). Being wealthy at an individual level is having a large amount of material possessions or consumable goods (or the ability to do so, with you investments and what you keep in the bank). The wealth of a nation is a summation of the wealth of all its individuals, a concept well elucidated by Adam Smith. When you go from a poor country to a rich country, you are astounded by how many goods people consume and how many material objects people possess in rich countries (the consumption shows they actually produce a large amount of these and other goods). When judging this one must bear in mind the higher quality of objects and consumable goods in rich country vs a rich country- for example, both countries might have an equal number of boats but the rich country will have some high quality, diesel or electric powered, large boats in a well kept marina, while a poor country will have some rugged wooden boats which are rowed by hand tied to some rocks, without a nice marina. The adage "better to reign in hell than to serve in heaven" is not true when it comes to you wanting to enjoy consumable goods and material objects, where even poor people in rich countries are better-off than the so called rich in poor countries. What makes a country poor or rich? I have proposed, without concrete proof (economics is not physics...) but backed by lots of anecdotal evidence mentioned in this article and other parts of this website, that it is the high degree of automation, the presence of tools and machines, which causes a country to become wealthy. By making these tools and machines, the net manual labor required to produce consumable goods and material objects goes down considerably; and more production is achieved for the same man-hours of work. This needs skills in Science, Technology, Engineering and Mathematics (STEM education), which should be the focus of education systems worldwide in all countries. Focusing on these produces people with the right skills to eventually produce and operate machines and tools (some machines like an airplane or a mining truck need a lot of technical skills just to operate them). Government policy should eventually be designed to encourage the production of tools and machines in all walks of life. Here's a friendly piece of advice to capital owners worldwide (I have run several small businesses myself, some successful, some not) -instead of employing workers, find machines and tools to do your jobs. You will get more done overall by employing machines, and your overall costs of production will almost always go down once you or someone else you employ learns to operate the tool/machine. By encouraging the use of machines you may not encourage manual labor in your own business, but you will encourage manual labor employed in producing, maintaining and installing those machines. You can think of yourself as providing the operators for those machines, and most of your capital should be spent in purchasing machines, and not in paying workers to do the job manually. What machines to employ to simplify the workings of your business becomes your main skill, not managing people and goading them to work (and please don't believe in management experts, motivation and leadership gurus, etc. they add little value to you or your company). Invest your time and money in finding newer machines to employ in your business, train the few workers you have in operating these machines well, and see your business do well! All successful businessmen I have known do this to varied degrees. Automation makes a business successful; hiring a lot of human beings does not (an easy proof of this is that the most populous countries are not the richest-there is no correlation between being a rich country and the country's population). And if you are a machine-maker business yourself, make your machines and tools better and better (possible by employing machines yourself, always remembering that those machines are also being made by someone), and you will find more and more sales for your business. This is especially true for consumer oriented machines, where the market is huge-witness the large amounts of money consumer electronic, computer and software, etc. company make. An overall focus both by capital owners and workers, and government policy, on creating machines to simplifying tasks, whether it is simple machines like a hair-dryer or a complicated one like a bulldozer, is the cause of the richness of a nation. Japan seems to have mastered this well; the Japanese love to create machines for even the simplest of operations. It is this spirit which needs to be encouraged in all countries, and it is this which is the cause of nations becoming wealthy, where their citizens can enjoy the pleasure of consuming a large amount of goods, with a continuous production of them in the factories behind. Both capital owners and workers benefit by these improvements in the productive powers of labor, by the employment of new tools, technologies, etc. Let me give you an example to clarify this: assume you have several wood cutting factories which were employing workers uses axes. Then the owners of these factories buy electric hacksaws. Assume electric hacksaws are 10 times more efficient and you need only 20 minutes to cut a tree, instead of 200 minutes using an ax. Once an electric hacksaw is employed, the same work can be done in 1/10 of the time. You can employ the worker to do 10 times the work, because now he can chop 10x the number of trees for the same hours worked. Since the output of each factory can go up by 10x by this operation of replacing axes with hacksaws, it increases the competition for labor-and the net result is that the worker can demand more wages per hour, because he can find jobs with other wood cutting facilities. Maybe the factory owners and the workers will settle for something in the middle- in the extra 9x chopped trees by this operation, maybe 6x will be kept by the factory owners, and the 3x chopped trees (or their wages in dollars) will be kept by the workers, whose real value of labor is increased by this operation. All parties-capital owners and the workers, benefit by the introduction of electric hacksaws instead of axes for chopping wood. The same holds for all improvements in technology and tools which simplify our jobs-they benefit the workers as much as they benefit the capital owners. Note that the workers needs to acquire a new skill-the operation of an electric hack saw in addition to using the ax. As we progress as humans, we operate newer and newer, more complex machines. To employ someone to make machine X, you need capital-materials for making the machine X, fixed capital employed in erecting the factory and the machines and tools employed to make the new machine X, and the wages which employees must be paid before machine X comes out of the factory. Economics is about increasing this capital stock of society.